We are most grateful to Littlegirl for once again coming to our aid and furnishing us with the very latest catering product information and providing a break down of bands and associated routes. So if you're not sure what to expect on your next short haul flight, all you need at hand is the departure time and the "band" your flight falls into. The main purpose of this thread is to encourage discussion on BA catering, so please do use this thread to share your opinions and add your own experiences of BA's short catering. Your own reports, menu listings and photographs are most welcome - appending some basic info such as route, date of travel (approximate) and class of travel are very useful datapoints. On short domestic flights (LBA, IOM, MAN, NCL), passengers are offered a hot toasted sandwich and orange juice in the morning. On Anglo-Scottish/Belfast domestic flights (ABZ, BHD, EDI, GLA), passengers are offered a hot breakfast and orange juice. On flights out of LHR, the hot dish is usually scrambled egg, bacon, sausage, mushrooms, and tomato and on flights departing from LGW and regional outstations, the hot dish is sausage, bacon, and tomato. The vegetarian option on LHR flights is currently a cheese omelette with chestnut mushroom sauce and slow roasted tomatoes, a fritatta with spinach and grilled tomatoes on LGW flights, and scrambled eggs, hash brown and veggie sausage on LCY flights. As an alternative to the hot options a cold continental breakfast (ham, egg and cheese box) is available on request. 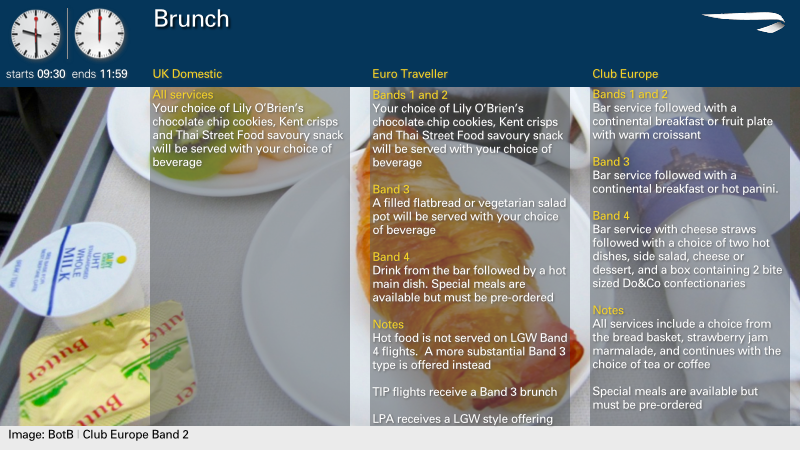 Recipes and ingredients do vary between LHR, LGW, and LCY flights. Portions tend to be marginally smaller on LCY flights. On longer Band 4 flights, passengers are offered a traditional hot breakfast and orange juice. Special meals are available but must be pre-ordered. On Band 1, 2, and 3 flights, passengers are offered a choice of a traditional hot breakfast or a vegetarian hot breakfast. Both come with a fruit plate. On LHR flights, a continental style cold plate alternative is also available which comes with yoghurt. All dishes are accompanied with a choice from the bread basket with Wilkin and Sons conserve or marmalade. Service continues with the choice of tea or coffee. Traditional breakfast of sausage, bacon, cheese omelette, tomato and mushrooms, served with fresh fruit plate. Vegetarian option of Spanish style frittata with potatoes, tomato and mushroom served with fresh fruit plate. Continental style plate of ham, red peppers with bacon cream cheese served with Greek yogurt with apricot and raspberry compote. Traditional breakfast of sausage, bacon, cheese omelette, tomato and mushroom, served with fresh fruit plate. Vegetarian option of scrambled eggs, tomato, mushroom with Welsh rabbit toast served with fresh fruit plate. Italian style cold plate of salami, prosciutto, Parmesan, olive, sun dried tomato, ricotta and artichoke served with wild berry Bircher muesli. Vegetarian option of scrambled egg filled tortilla, tomato, spinach, potato and Mornay sauce served with fresh fruit plate. Continental style breakfast of a charcuterie of hams and cheeses served with Greek yogurt with pear and walnut and topped with granola. Greek yogurt with apricot compote and raspberry garnish. On all short domestic flights the service from 09:30 onwards is the same and that is your choice of Lily O’Brien’s chocolate chip cookies, Kent crisps or Thai Street Food savoury snack, served with your choice of beverage. On Band 1 and 2 flights, passengers are offered a choice of continental breakfast or fruit plate with warm croissant. At the moment, both options are accompanied your choice of apple lattice, bread roll or croissant. A pot of Wilkin and Sons preserve or marmalade and butter is included on your tray. Service continues with the choice of tea or coffee. On Band 3 flights, passengers are offered a choice of continental breakfast or fruit plate with warm croissant. At the moment, both options are accompanied your choice of apple lattice, bread roll or croissant. A pot of Wilkin and Sons preserve or marmalade and butter is included on your tray. Service continues with the choice of tea or coffee. On Band 4 flights, following the bar service passengers are offered a side salad along with a hot main and your choice of a cheese plate with crackers or dessert. Service continues with the choice of tea or coffee. Grilled Cod fillet on mustard mashed potato with broccoli tomato, and carrots. On Band 1 and 2 flights, passengers are offered a cold salad, accompanied by a Do&Co dessert. Service continues with the choice of tea or coffee. Timbale of smoked salmon tartar, grilled king prawns, fennel, mousseline, mixed salad, pine nuts, and lemon. Black Forest ham, herbed goat cheese, beetroot salad, peppers, and mixed salad. Sautéed king prawns on Niçoise salad, egg, tomato, French beans, red onion, olive, spinach, lettuce, and pea shoots. 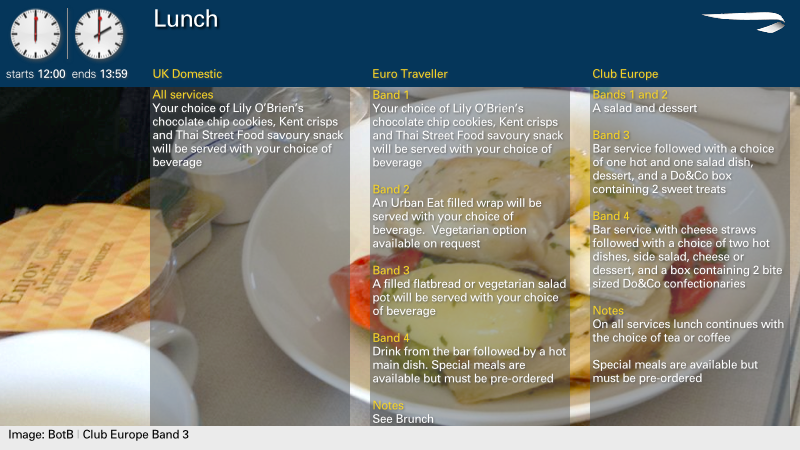 On Band 3 flights, following the bar service passengers are offered a choice of either a hot dish or cold salad, accompanied by a Do&Co dessert. Service continues with the choice of tea or coffee. Slow roasted pork with Savoy cabbage, swede, and courgette. Chicken wrapped in Parma ham with pumpkin gnocchi, aubergine, courgette tomato, and herb butter. Malabar seafood curry (cod and prawns) potatoes, aubergine, peas, beans, carrots, and red peppers. Chicken breast stuffed with aubergine and goat cheese served with potato gratin, red peppers, and asparagus. Lamb Anard curry (Tamarind) Basmati rice, pumpkin Rayo Spinach, and aubergine. Grilled chicken supreme on celery mash with carrots, swede, courgette, and cherry tomato. Fillet Steak with daupinoise potatoes, button mushrooms, asparagus, cherry tomatoes, and cafe de Paris butter. 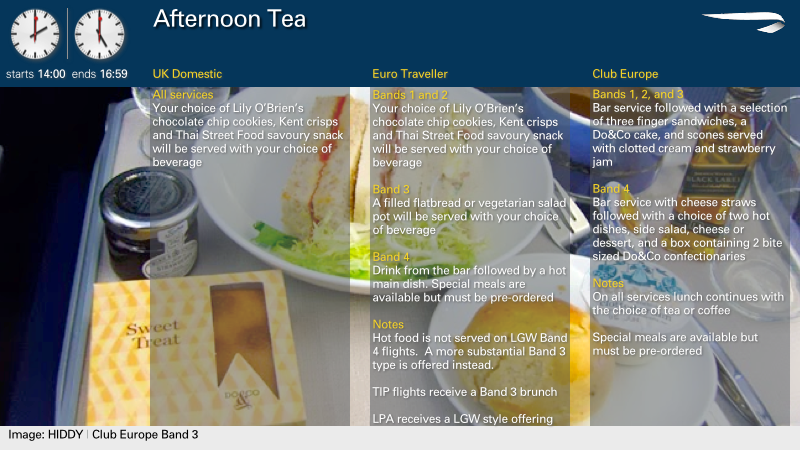 On Band 1, 2, and 3 flights, following the bar service passengers are offered a selection of finger sandwiches, accompanied by a Do&Co cake (chocolate orange cake or coffee and walnut cake), and a round of warm scones (plain or lemon and date). A pot of Wilkin and Sons conserve and Rodda's classic Cornish clotted cream is included on your tray. Service continues with the choice of tea or coffee. On Band 3 flights, following the bar service passengers are offered a choice of either a hot dish or cold salad, accompanied by a cheese plate with Fudge crackers, and a Do&Co box containing two sweet treats (typically a chocolate and a macaron). Service continues with the choice of tea or coffee. Does not contain fish, shellfish, meat, poultry or eggs. It is a meatless meal and spicy in content. Contains a combination of familiar and fun foods. Available on all longhaul services for children aged 2-12 years and on certain shorthaul services. Note, meals should be booked 24 hours in advance as only a limited supply of extra meals are carried. May contain beef and pork products. For those who need to manage blood sugar levels. Foods excluded are sugars, syrups, jams, cakes and chocolate, unless specifically for diabetics. Foods excluded are wheat or wheat flour, barley oats and rye, bread, cakes (unless wheat free), pastry, sausages or any flour based products. Does not contain beef, beef derivatives, veal or pork, it is not a meatless meal. These meals are prepared to comply with Jewish dietary laws. Does not contain meat, fish or seafood. May contain dairy products such as milk, butter, cheese and eggs etc. A low calorie diet should not contain excessive protein portions and the meal is low in fat and sugar. High fibre meal with reduced amounts of fat. Excludes cheese, dairy products and their derivatives and lactose or milk products. Excludes use of salt, MSG and baking soda/powder, instead herbs and spices are used to flavour the meal. Does not contain meat, fish, fowl, eggs, honey, dairy products or derivatives. If vegan is not specified, then a lacto ovo meal will be provided. Special meals cannot be ordered in advance on UK Domestic or Euro Traveller (with the exception of LHR Band 4 flights). However, a vegetarian alternative will be available on board. Just ask! Baby meals are not available on short haul flights. The following lists the standard bar contents on LHR UK Domestic flights. All contents are subject to change and to availability. Standard tariff applies across all short haul bands (free, gratis, on the house). Lists are correct as of October 2011 and will not be entirely accurate. Note, not all the items listed above are available on equivalent LGW routes. The bars are also loaded with plastic sealed “cup-lets” of orange juice and water, and these will be used till they run out before opening the large cartons and bottles. * Tomato juice are not usually loaded on LGW Band 1 routes. Customers cannot order a SPML in ET on any flights to/from LGW. We carry some vegetarian options on all flights where meat options are served. 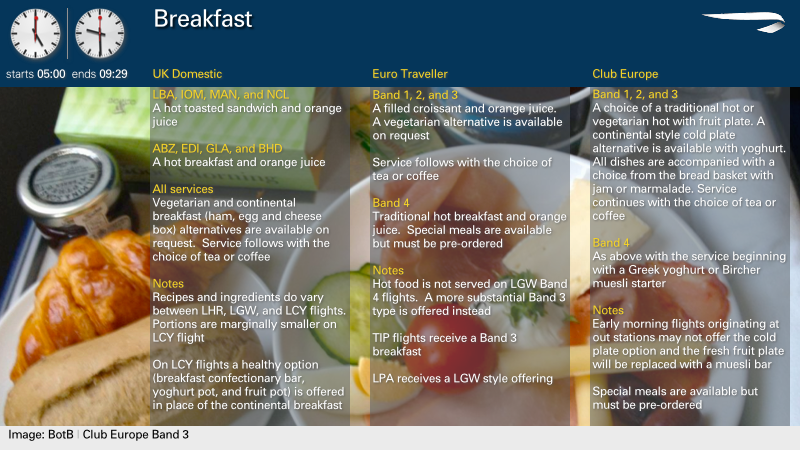 As already mentioned, LGW CE meals can be different and looking at the list above they are completely different. I'll try my best to get all the options as soon as I can. Last edited by Yesitsme; Jan 11, 14 at 12:29 pm Reason: Left out the essential word "domestics"
Is Dow Ruby Port available on bands 1-3 in CE? The continental breakfast isn't (afaik) offered on flights to/from LGW. Thank you. I've made a few "catch all" adjustments to the narratives which I hope gives a more accurate distinction between what is loaded on LGW and LHR flights. If you are able to add any LGW specifics, I'll be delighted to incorporate this into the guide. For those so inclined, we now have 3 or 4 Slimline Tonics in each bar instead of 2. 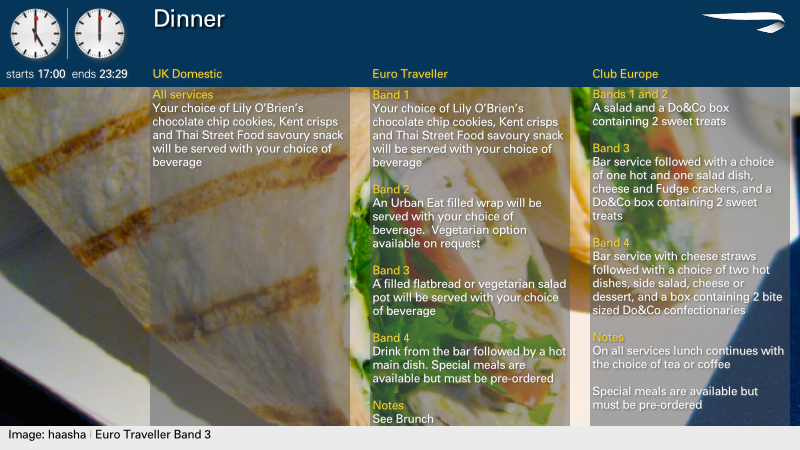 Band 3 flights: Urban Eat "double" wrap. Chicken Caesar, BLT, Coronation Chicken, Harissa Chicken. Veg options: Falafel or Mozzarella & tomato. These are the flavours I can remember from the top of my head. Only one meat option and one veg option carried on each flight. ET Breakfast box: oj couplet, cheese croissant and Moma Bircher muesli yogurt pot. great , thanks for the updates. I found the last thread particularly helpful, as was new to shorthaul (indeed still am quite new), especially having littlegirl around. Great thread. Loving the fact that there's not a smoked salmon salad on the CE list for Band 1 and 2 for dinner. Looking forward to my next trips to GVA now - I was always unlucky with the rotations.